Ken qualified as an Architect in 1989, having studied at Scott Sutherland School of Architecture in Aberdeen and the Illinois Institute of Technology in Chicago. He worked for two years with BDP in London before returning to Scotland to join the Kennedy Partnership in Edinburgh in 1990 where he worked on various commercial and leisure projects including the Leith Central Station Regeneration Project, a joint venture initiative with the City of Edinburgh Council. He joined Ryden Property Consultants in 1994. 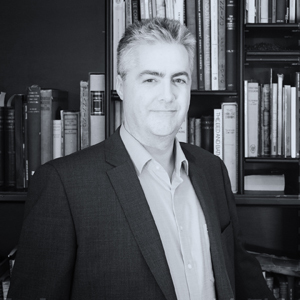 During his time with Ryden he acted as architect and project manager in relation to a large number of projects for public and private sector clients from inception through to completion gaining the wide ranging design and contractual experience that forms the essential grounding for his present role. He was design architect for the Ardbeg Distillery Visitor Centre on Islay and architect and project manager for the extension of Lord Cullen House in Aberdeen. Ken joined the Hurd Rolland Partnership in 1998 and became a partner in 2001. Since 2004 he has been partner in charge of the specialist services provided by the Partnership. His principal areas of expertise are in the provision of independent expert opinion in relation to all forms of construction and professional negligence disputes and in the provision of specialist strategic and planning advice in relation to built heritage matters. Ken has produced more than 200 expert reports and given evidence in the Court of Session, in various Sheriff Courts (Aberdeen, Paisley, Glasgow, Stonehaven, Dundee) and in relation to very many adjudications and mediations. He has acted as both an Adjudicator and Mediator, is on the RIAS Panel of Experts and Mediators and is an appointed investigator for the ARB. As a Built Heritage Advisor, Ken has prepared Heritage Statements setting out the case for Planning and Listed Building Consent for Quartermile (former Royal Infirmary), Fountainbridge and South Side of St Andrew Square in Edinburgh, Ruchill Hospital and Candleriggs in Glasgow and Marischal Square and former Woolmanhill Hospital in Aberdeen. He has provided expert evidence at various Public Planning Inquiries including those for the regeneration of Queen Street Station in Glasgow and Haymarket in Edinburgh. Ken is the author of “Design and Development of Heritage Sensitive Sites (Listed Buildings and Conservation Areas),” published by Routledge/Taylor Francis.